Spend a day or two rafting Class III white water in inflatable kayaks (Fun-Yaks). Our Christian staff and guides will teach you the basics for our white water kayaking trips before we head down the river to meet the waves face to face as you enter rapids at water level! Work in pairs to navigate your yak for a fun, challenging, and growing experience of a lifetime. The South Fork of the American River in Northern California has two, ten mile sections (the Upper-Chili-Bar Run and the Lower-Gorge Run) perfect for one or two days of white water inflatable kayak trips. Each section is full of adventurous fun for Church youth groups, families, individuals, or Christian private schools. Both the Upper and Lower South Fork of the American River take about 4 hours to yak down during the summer months. While you can request the Upper or Lower, we are currently not always able to guarantee which section you will experience. 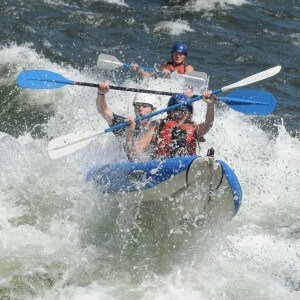 There are quite a few obvious differences between white water river rafting in a raft versus in an inflatable kayak. The most significant end result is that on day trips with 20 people rafting you might see one or two people accidentally fall out (more likely none) at some point in the trip. While if those same 20 people are in kayaks, you might only see one or two people stay in their kayak the entire time. While we include more guides on our kayaking tours than our rafting tours, about two out of three kayaks will not have a guide in it. This means that often times you’ll find yourself and a friend battling the waves together and relying upon each other’s abilities versus resting in the expert abilities of your guide. Now this doesn’t mean that you’ll be touring the river all on your own. Your guides of course will be close by, assisting you, giving instructions, showing you where to go, and helping to picking you and your paddles out of the water when you fall out. Overall, inflatable kayaking tours are best suited for older youth excited about some added challenges, comfortable with the probability of falling out, and eager to take control of the path they take through the rapids. Check out our popular 1-5 day Christian camps in California or just let us know and we can help you customize the perfect camp with kayak trips just for you. You can lead campfire and other teaching opportunities yourself, combine your teaching efforts with those of our staff, or just ask us to handle it all for you – at no additional charge. All prices are per person and based on doing adventures Monday through Friday. There is an extra $15 charge for adventures on Saturday or Sunday. For kayaking October through May, expect an $15 fee that helps us with added expenditures in those months. Wetsuits are also included at no extra cost Oct-May. THERE ARE NO ADDITIONAL RENTALS, FEES, TAXES OR HIDDEN COSTS.